Last week I found myself increasingly displeased with my workday habits. I did get things done, but I mostly felt distracted and that I wasn’t working efficiently. I have a few ideas about how to improve that situation, which is the primary focus of this week. Making sure that my work habits are strong is key to having time for my creative work. * Start working on next section of WIP — November’s writers’ group meeting is on deck…..
you hit the nail on the head with your opening sentence, m.
– continued reading to my heart’s content – actually analyzing what I would or would not fix in the writing. – figure out when to start NaNo, as I’ll be out of town on work until saturday. – look up instructions for new knitting project. Awesome, Heather! I’m getting itchy for needlework myself, but I’m kind of stuck in the sweater I was working on years ago. I’m thinking about learning to crochet. Is that a good idea, do you think, or would I be better served trying to improve my knitting skills?? I’ve been told by my mother in law that crochet is easier. I feel discipline is important to creativity. As a painter I have a goal of painting something each day. However, if I am engaged in viewing art, drawing or another creative activity including taking a walk and observing nature I count that as effort in the same direction. I quite agree. Filling the creative well is vital. I will be continuing with morning pages as well as walking with my dogs in the morning. A change will be to make my daughter’s lunch the night before. This is a simple way to make my morning back into productive soul & creative time. I’m also looking at November (starting this week? Eeps!) as a month of creative completion. This past weekend I had intended on starting a new piece. It didn’t happen! However, I did go to the art gallery and see the Ai Weiwei and David Bowie exhibits so I was absorbing something (right?). Feeling guilty, but more importantly feeling motivated, I got down to it last night and started creating. Sadly my day job gets in the way of me working on it during the day but I will get back to it tonight. Intention this week: finish this piece by Saturday night. 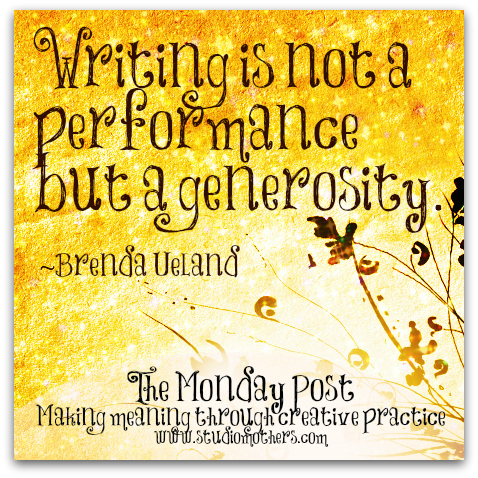 The Monday post- on a Tuesday! Why not?! Tonight, with no soccer practice to get to, the girls and I WILL go for a walk before dinner. And after, I’m going to turn off the TV, pull out paper and crayons, pencils, markers, toss them in the middle of the room, and see what we come up with. Definitely – it’s a time to relax and repair. I’m glad my girls are soccer-only. By the time the bruises heal and the aches go away, they’re ready to start another season. To tell a story is to share an experience…open up and offer your own insights…Commit to a regular creativity practice. Regularity — a daily practice, if possible — is key to staying in touch with how you make meaning.